I love involving Titus in the kitchen. Sure, he's small, but he's definitely able to do a lot of stuff. And he is so interested! He'll move his chair, climb up and see what we're doing, and he often plays with various kitchen utensils... not always a good thing, we recently had an incident involving both Nespresso machines, a cupful of sugar and a lot of salt. Oh well. It cleaned up, eventually. Anyway. 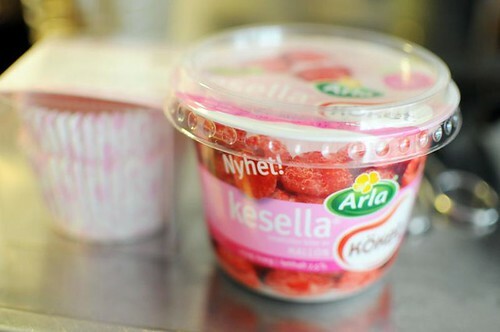 Arla - the Swedish dairy producer - sent me two flavored quarks to review, raspberry and rhubarb. They also included a box of really cute cupcake liners, and a recipe for raspberry muffins. Well, how could I resist that? And after all, it's the perfect project with kids. 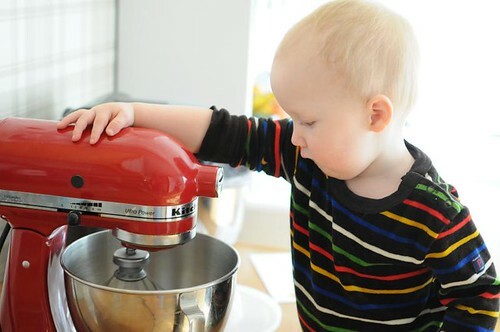 To be honest, he only really showed interest in the mixing part, and later, with the tasting part. They turned out pretty good! I know it's a rather specific recipe and revolves around a product many of you won't ever see. I don't really like doing that but I think raspberry-flavored yogurt might make a nice substitute, though! Beat eggs and sugar until very fluffy. Add the melted butter and the quark. Stir in baking powder and flour and mix gently. Divide into cupcake liners, placed in a muffin tin. 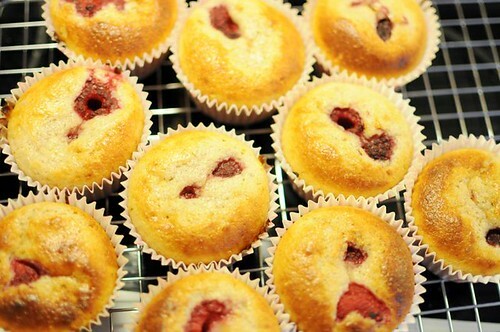 Stick two raspberries into each muffin. Bake at 200°C for 10-12 minutes. I love little munchkins in the kitchen, lovely bake. I know what a strange quark is, but for those of us on the other side of the planet, WTF is a raspberry quark? Alex - Google is our friend :) http://en.wikipedia.org/wiki/Quark_(cheese) The Swedish Kesella is made from milk and cream, but is very low in fat.